Desiccant bags are used to absorb moisture in order to achieve a moisture level optimal for the product during storage or transit. Moisture is often harmful and can lead to rusting, corrosion, etc. What a desiccant bag does is to absorb the moisture and bind it within the desiccant bag itself. 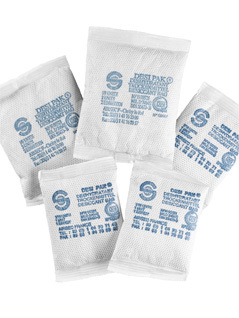 Desiccant bags are made in such a way that moisture can enter but not escape. 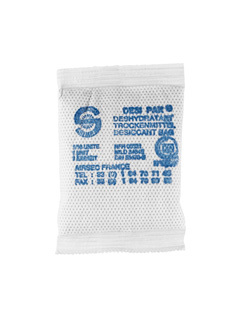 Desiccant bags are available in many sizes, so you will always find one to suit your purposes. Available for small and medium-sized consignments, containers and very large consignments. How do desiccant bags work? For a desiccant bag to function optimally it must be placed in an airtight system which does not allow air to circulate into the product. An airtight system is usually created using aluminium foil/barrier foil, within which the product is stored or transported. Many people mistakenly believe that desiccant can have the desired effect simply by wrapping a product in plastic stretch film or stretch foil and then placing desiccant inside. However, because plastic foil is not airtight, air continues to circulate around the product - also after the desiccant bag has absorbed moisture to capacity -and remaining moisture in the air will damage the product as a result. It is therefore absolutely vital to create an airtight system using desiccant bags if you want to be entirely sure that your product will not be damaged by moisture during transit or in storage - regardless of weather conditions. Moisture capacity is assessed in units. 1 is the equivalent of the ability to absorb 6 g of moisture from the air. The weight of desiccant constituting 1 unit depends on the type used, but all desiccant bags with a rating of 1 can absorb 6 g of moisture, which is the international standard. Desiccant bags containing Bentonite, which is extracted from the ground, primarily in Turkey and China. As you will see from the illustration above, the Bentonite used in desiccant bags constitutes dark granules. What is the difference between Silica Gel and Bentonite? The difference between Bentonite and Silica Gel is that Bentonite is a natural product, whereas Silica Gel is a chemically manufactured product. Bentonite is usually used in bags classified above 1 unit, whereas Silica Gel is used in very small desiccant bags. In other words, Silica Gel is often used by the medical industry. Although there is no difference in their ability to absorb moisture, Silica Gel is rather more expensive because of the chemical manufacturing process. The amount of desiccant to be used depends on the size of the product to be transported or stored. The larger the product, the larger the quantity of desiccant required. The amount also depends on how long one wishes to protect the product. Sometimes a product will be transported domestically, which doesn't take more than a couple of days. On other occasions the product will go by sea, which can take as long as 2-3 months. Sometimes a product will go into storage for 2-3 years. Does the weather play a role in the quantity of desiccant required? The weather plays a major role. For example, condensation will occur when you e.g. package of product at one temperature and send it through areas at other temperatures. I.e. the use of desiccant is not necessary if you can maintain the same temperature and humidity around the product during the entire transit process or until it comes out of storage. In practice this is impossible, for which reason it is necessary to use desiccant and therefore also aluminium/barrier foil regardless of where in Europe you may live and regardless of whether the product is transported domestically or sent abroad/overseas. A calculated amount of desiccant is required inside the barrier foil bag to adsorb any existing water vapour and to neutralise the small amounts of water vapour which may pass through the barrier foil. We can advise customers on the most appropriate size and quantity for the barrier foil application.